Well. Things had been going so good. :0 Let's just say that my euphoric little St. Francis-along got put to the test this past week. All of that business about praying upon rising, setting up a positive mindset for the day, and anticipating challenges and solutions before the fact so as to retain interior peace? All tested this week, for sure. I didn't despair, and I didn't give up. And I didn't totally fail, which I call and out-and-out win. But it was harder. It started with apathy late last week. It was simply more difficult to feel joyful and enthusiastic in my classes. But I powered through it. I paused for a lovely birthday weekend, which I figured would recharge me. For all of its loveliness, I came in Monday morning feeling just as unjoyful and unenthusiastic about my classes as I had on Friday. I powered through it again, but much more weakly this time. And yesterday? "THAT DOES IT! YOU ALL NEED TO BE *MORE FRIENDLY*!!!!!!!!" "...the Direction of Intention is a simple prayer, uttered briefly at the outset of whatever we are about to do...creating in us a new spiritual habit - the habit of asking and offering and accepting before doing. By first directing the intention with which we act, we address what we do to God, whom we love. By fashioning our deeds in this way, we render indifferent acts good (rather than merely circumstantial) and good deeds even better (by adding a positive motivation)." So, as we go about our day, we utter a simple prayer before embarking on something that does 3 things: asks, offers, and accepts. This is called "directing our intentions," and it means that we can transform our indifferent, circumstantial acts into good ones (like walking from one place to another, or attending a meeting), and our good deeds to even better ones (like when we interact with our colleagues or students). How does this prayer actually work? (1) Ask for God's grace. "Asking shifts our focus of our attention away from ourselves and our natural self-centeredness." (2) Offer to God all the good we will do. "...by intending to do what we do, not for our sake, but for God's, we trade the pleasure principle (acting out of self-interest) for a generosity principle (acting for the good of another). When we adopt this principle and direct what we are to do toward God, something natural becomes supernatural." (3) Promise to accept whatever may come and bear with whatever may happen, even if this entails pain and suffering. "This act of abandonment puts into practice a 'providential' view of the world." Asking, offering and accepting. 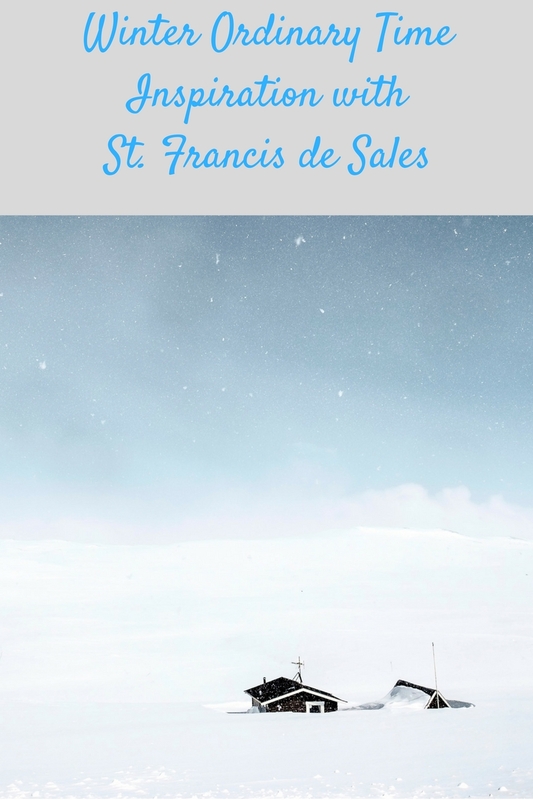 "For St. Francis de Sales, living well depends not on positive circumstances or successful outcomes but only on the grace-filled transformation that occurs 'from the inside out.'" On this, I need to be more consistent. So this isn't just in the morning after we pray our morning prayer, and set our mind to a positive attitude, planning for the challenges that may lie ahead. This goes for everything that occurs in our day. We offer this three-fold prayer (asking, offering, accepting) again and again and again. This could be a Lenten goal, for sure. What are your thoughts on Chapter 5? Next week we turn to meals! Holy eating? How perfect for Ash Wednesday! Hi Robin! I love the quotes that you chose. Indeed, a tremendous burden is lifted from our shoulders with this chapter. If you anticipate the hurt, it hurts only superficially. I love that. A few weeks ago, a colleague of mine came back from the ladies room feeling hurt that she had overheard some girls from our class commenting on how "boring" they felt our lab was, and how we "told bad jokes." I don't blame her for feeling hurt, it bothered me a little too. But because I now anticipate crappy :) things like this happening (it is unavoidable, no matter how good of a teacher you are, and how funny other people find your jokes) I was able to brush it aside much more easily. We endeavor to do the best that we can, accepting whatever happens as God's will, and we need not worry about it any further. "For this reason, St. Francis de Sales counsels us to pause, ever so briefly, before anything we do and make a threefold prayer in which we ask for God's grace, offer to God the action we are about to do, and promise to accept whatever will happen to us in the process." This is going to be my goal this week, *especially* while teaching. Once I get into the habit of it, I think it will be easier to remember to pray as I go. I like the thought of doing this often throughout the day before we do anything. "By professing humility at the outset and offering our work to God, we do the only things we can do. We cannot control circumstances. We cannot determine outcomes. But we can lessen any frantic concerns about what may or may not happen to us by entrusting all that we do into 'the fatherly hand of our good God and Savior.'" I need this reminder. Often. God isn't going to leave me hanging, and I need to trust Him more. He has a plan, even if I can't see it or understand it right now. He's preparing me for it. I had a harder time this week. More in making the time to read the chapter than with the actual content of the chapter. Therefore this quote really stood out to me, “With so many things calling for our attention, we often run the risk of doing more than being.” While I've done a decent job with the morning offering, this aspect of praying through out the day will take effort to be become a habit. A perfect project for lent. Ash Wednesday is tomorrow. Are you ready? !